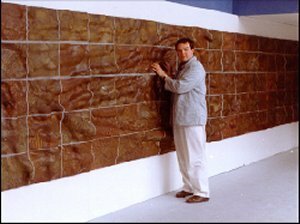 I presented my tactile architectural ceramic wall mural titled 'In Touch' as part of the 1993 Craft Design degree exhibition at the National College of Art and Design, Dublin. The group exhibition involved 19 participants from the disciplines of ceramics, glass and metal work. The work in high fired hand built stoneware ceramics is an assertion and a self portrait of using a tactile set of references as a source of inspiration and as a means to work directly with the plastic clay to build up surfaces for touching. It was aimed at encouraging people to experience by touch and to bring alive the tactile aesthetic that I believe all people possess. This approach has its roots very firmly in the fact that since I was very young I have used touch and sound in parallel with my visual sense to experience and understand the many facades of the environment I live in. In recent years the need to develop a language which would allow me to explore the way in which I relate to my environment through the sense of touch has steadily grown. This need has arisen out of my desire to establish a clear set of tactile references. Having a visual impairment in many respects has given me the opportunity to work with touch and has also been advanced by my interest in helping other people appreciate these opportunities. Working intuitively with the clay I evolved a way of handling the material very similar to the way a masseur would work in holistic massage, eyes closed, relaxed and concentrated on treating the surface in its many different aspects but also as a whole. In addition, Japanese artists/art teachers in schools for the blind, who have been developing touch-art techniques since the 1950s, influenced this sculpture.